Canada day is just around the corner and this year is a special one! Its no surprise that this year Canada celebrates 150! I’m a big fan of eating healthy and delicious food. These are some of my personal recipes that are also crowd pleasers and a great way to kick off summer in Canada with family and friends. A number of these recipes are from my personal DASH diet collection of recipes. DASH is an acronym, which stands for Dietary Approaches to Stop Hypertension. It’s an eating plan that’s rich in healthy carbohydrates like whole grains, fruits and vegetables, but low in saturated and added fats and sugars. It also includes lean meats, fish and shellfish, beans and low-fat dairy. Add oil to the pan. When hot add shrimp. Season with salt and pepper. When the shrimp is cooked on one side, about 2 minutes, turn over and add garlic. Sauté another one to two minutes until shrimp is cooked. Remove from heat. Squeeze lime all over shrimp and toss with cilantro. Serve hot. Peel sweet potatoes; cut in half crosswise and then into wedges about 1 inch wide. Crush garlic clove into its skin. 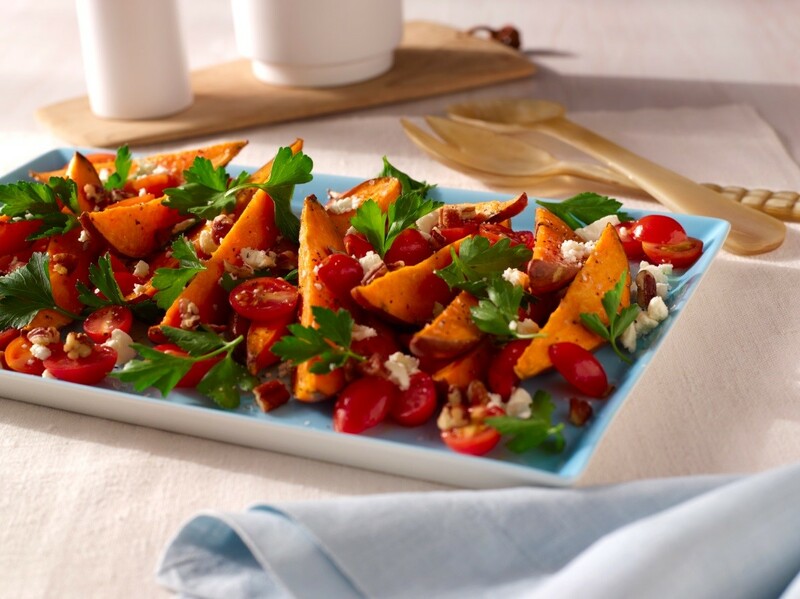 On rimmed baking sheet, toss sweet potatoes with garlic, olive oil, thyme, red pepper and salt. Roast until soft, about 30 minutes. Right before serving toss with cilantro or parsley, cherry tomatoes and walnuts (optional). 2. Place tomato sauce and bacon in a large sauté pan and cook over medium heat to further concentrate the sauce’s flavors. 3. Cook the spaghetti until just shy of tender. Reserve some of the pasta cooking water and gently drain the spaghetti. Add the spaghetti and a little of the pasta cooking water to the pan with the sauce. Increase the heat to medium-high and let the pasta finish cooking in the sauce. The sauce should coat the pasta and when you shake the pan, the sauce and pasta should move together. 4. Take the pan off the heat and add the Parmigiano-Reggiano, butter, and basil. Using two wooden spoons toss everything together well. 5. Divide the pasta among serving bowls. Finish with a drizzle of extra-virgin olive oil and serve. Stir in garlic, ginger, cinnamon, cumin, coriander, salt, cayenne, and turmeric. Cook for one minute over medium heat, stirring constantly. Mix in garbanzo beans and their liquid. Continue to cook and stir until all ingredients are well blended and heated through. Remove from heat. Stir in cilantro just before serving. Garnish with shallot.